The activity concentrations of natural radionuclides in the sediments from Pulicat Lake to Vada Nemmeli of Chennai Coast, Tamil Nadu, have been measured using gamma-ray spectrometry. The average concentration of 238U, 232Th, and 40K are 10.14, 35.02, and 425.82 Bq/kg, respectively, in sediments. Using measured activity concentrations of natural radionuclides, the radium equivalent activity (Raeq) was calculated to assess radiation hazard associated with the sediments. The calculated Raeqvalue of all the locations showed less than the recommended safe limit. The obtained results of the study could serve as an important baseline for radiometric data for future monitoring initiatives in the study area. Natural radionuclides have been the components of the earth since its existence. They are widely spread in the earth's environment and exists in soil, sediments, water, plants, and air. There are many naturally occurring radionuclides in the environment, containing uranium and thorium series radioisotopes and 40 K associated with natural potassium. The natural radioactivity in sediments and soil comes from U and Th series and 40 K associated with natural potassium. Sediments and soil act as a medium of migration for transfer of radionuclides to the biological systems, and hence, it is the basic indicator of radiological contamination in the environment. Moreover, the sediment radioactivity is usually important to establish baseline data for future radiation impact assessment, radiation protection, and exploration. Natural environmental radioactivity and associated external exposure due to gamma radiation depend primarily on the geological conditions of soil and sediment formations of each region in the world. The study of natural radioactivity in the marine and coastal environments is important for better understanding of oceanographic and sedimentological processes. The distribution of natural radionuclides in the seabed can be used as a tracer for both sediments and dredged soil dispersal and accumulation mechanisms. They also provide an estimation of the sedimentological composition of the seabed. Usually, the activity concentration of radionuclides increases inversely with the grain size  and in proportion with the density of the sediment. The U, Th radionuclides are associated with heavy minerals, whereas 40 K is concentrated within clay minerals. In addition, other parameters such as mineralogy, organic content, and geochemical composition could play an important role in the absorption of radioactive elements in the sediments. The main objective of this study is to determine natural radionuclide concentrations in sediment samples in and around Chennai, i.e., East Coast of Tamil Nadu, India, and associated radiation hazards. This coast is a very important environmental, economical, commercial, agricultural, and recreational location in Tamil Nadu, India. The result of this study provides data on the level of natural radioactive background. Sediment samples were collected from Pulicat Lake to Vada Nemmeli of Chennai Coast along the Bay of Bengal Coastline in Southeastern India using a Petersen grab sampler from 10 m water depths parallel to the shoreline during the premonsoon condition. Petersen grab sampler is ideal for near-shore sampling with sea bottom having sand, silt, or gravel type of sediments. This is the universal method of sediment sample collection for sea bottom sediment sampling at near-shore environment. All sampling points were located parallel to the shoreline as depicted in [Figure 1]. The grab sampler collects the samples at 10 cm below the seabed in all sampling points. Around 25 cm thick subsurface samples from the seabed were collected by the grab. From this, 10 cm thick sediment layer was sampled from the middle of the grab to avoid metal contamination by the jaws of the grab. [Table 1] shows the geographic coordinates (latitudes and longitudes) of the various sampling locations. Garmin Oregon 550, a handheld global positioning system, was utilized to locate position of sampling points. The distance between two stations such as Pulicat Lake and Konankuppam was of 3 nautical mile. This distance is kept constant among all the 22 sampling stations. Coastal craft was utilized for collecting samples at each station. The sample collection personnel approach the beach opposite to the designated sampling station by road and hire boat from artisanal fisherman to approach the sampling point located within 60 min of sailing. This approach was adapted for all the 22 sampling locations to collect samples. The collected samples were immediately transferred to polyethene bags to avoid the sediment samples contact with the metallic dredge, and the top sediment layer was scooped with an acid washed plastic spatula. Samples were stored in plastic bags and kept in refrigeration at −4°C until analysis. Then, the samples were air-dried at 105°C for 24 h to a constant weight and sieved through 250 μ mesh. The homogenized sample was placed in a 250 g airtight PVC container. The inner lid was placed and closed tightly with outer cap. Each sediment sample container was left for at least 5 weeks to reach secular equilibrium between radium and thorium and their progenies. Sediment samples were subjected to gamma spectral analysis with a counting time of 20,000 s. A 3 inch × 3 inch NaI (Tl) detector was employed with adequate lead shielding which reduced the background by a factor of about 95%. The concentrations of various radionuclides of interest were determined in Bq/kg using the count spectra. To find out the radioactivity content in sediment samples, the systems have to be efficiency calibrated for various energies of interest in the selected sample geometry. As the measurement is for the natural radioactive elements 40 K, uranium, and thorium, the gamma energies selected are 1460 keV for 40 K, 1763 keV (from daughter product 214 Bi) for uranium, and 2614 keV (from daughter product 208 Tl) for thorium. The detection limit of NaI(Tl) detector system for 40 K,238 U, and 232 Th is 8.50, 2.21, and 2.11 Bq/kg, respectively, for a counting time of 20,000 s.
The activity concentrations of 238 U,232 Th, and 40 K in sediment samples are given in [Table 2]. All values are given in Bq/kg of dry weight. The activities range and mean values (in brackets) are for 238 U,232 Th, and 40 K are ≤2.21 (BDL)–31.03 (10.14), ≤2.11 (BDL)–168.4 (35.02), and 330.91–540.02 (425.82) Bq/kg, respectively. 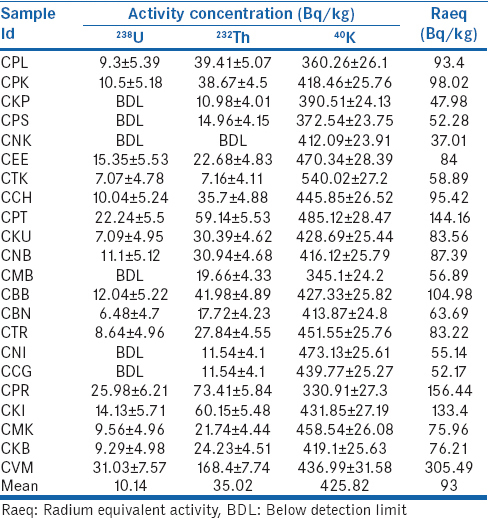 The wide variations of the activity concentration values are due to their presence in the marine environment and their physical, chemical, and geochemical properties., The results show that the mean activity of 238 U,232 Th, and 40 K around the world average values (35 Bq/kg for 238 U, 30 Bq/kg for 232 Th, and 400 Bq/kg for 40 K) of radionuclides in the sediments. 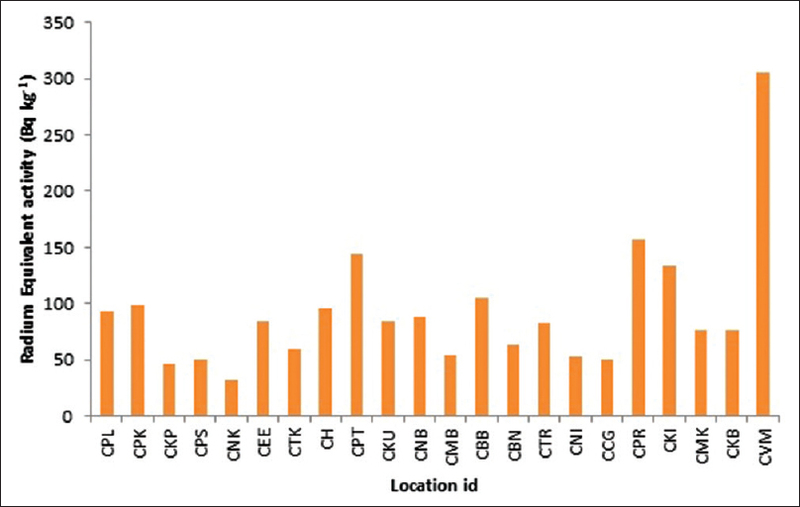 [Figure 2] shows the variation of activity concentration with sampling locations. Where ARa, ATh, and AK are activity concentration of radionuclides, respectively. The calculated value of Raeq varies from 37.01 to 305.49 Bq/kg, with an average of 93 Bq/kg. This average Raeq is less than the recommended value of 370 Bq/kg. Hence, there is no significant radiation hazard in the study area and sediments can be used as building materials for construction purposes. [Figure 3] shows the variation of Raeq with location Id. 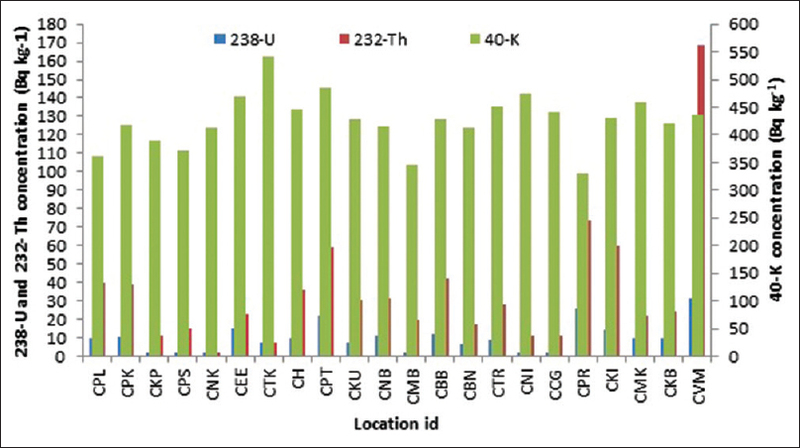 Activity levels of 238 U,232 Th, and 40 K have been measured using gamma-ray spectrometry in sediments from Pulicat Lake to Vada Nemmeli of Chennai Coast, Tamil Nadu. The calculated average activity concentration of radionuclides around the world average value. The Raeq of the samples showed less than the recommended value of 370 Bq/kg. Hence, sediments do not pose any significant radiation hazards due to concentration of natural radionuclides in the study area. One of the authors (R. Ravisankar) wishes to express his high gratitude to Dr. B. Venkatraman, Group Director, Health, Safety and Environmental Group, Indira Gandhi Centre for Atomic Research (IGCAR), Kalpakkam, Tamil Nadu, India, for giving permission to use the nuclear counting facility in Radiological Safety Division. Our special thanks to Dr. M. T. Jose, Head, RSD, IGCAR, for his keen help, constant encouragements in gamma-ray spectroscopic measurements and also Mr. R. Mathiarasu, Scientific Officer, RSD, IGCAR, for his technical help in counting the samples. Degerlier M, Karahan G, Ozger G. Radioactivity concentrations and dose assessment for soil samples around Adana, Turkey. J Environ Radioact 2008;99:1018-25. Dugalic G, Krstic D, Jelic M, Nikezic D, Milenkovic B, Pucarevic M, et al. Heavy metals, organics and radioactivity in soil of Western Serbia. J Hazard Mater 2010;177:697-702. Venema LB, de Meijer RJ. Natural radionuclides as tracers of the dispersal of dredge spoil dumped at sea. J Environ Radioact 2001;55:221-39. Ligero RA, Ramos-Lerate I, Barrera M, Casas-Ruiz M. Relationships between sea-bed radionuclide activities and some sedimentological variables. J Environ Radioact 2001;57:7-19. He Q, Walling DE. Interpreting particle size effects in the adsorption of 137 Cs and unsupported 210 Pb by mineral soils and sediments. J Environ Radioact 1996;30:117-37. Schuiling RD, De Meijer RJ, Riezebos HJ, Scholten MJ. Grain size distribution of different mineral in a sediment as a function of their specific density. Geologie en Mijnbouw 1985;64:199-203. Cho YH, Jeong CH, Hahn RS. Sorption characteristics of 137 Cs onto clay minerals: Effect of mineral structure and ionic strength. J Radioanal Nucl Chem 1996;204:33-43. Ravisankar R, Chandramohan J, Chandrasekaran A, Prince Prakash Jebakumar J, Vijayalakshmi I, Vijayagopal P, et al. 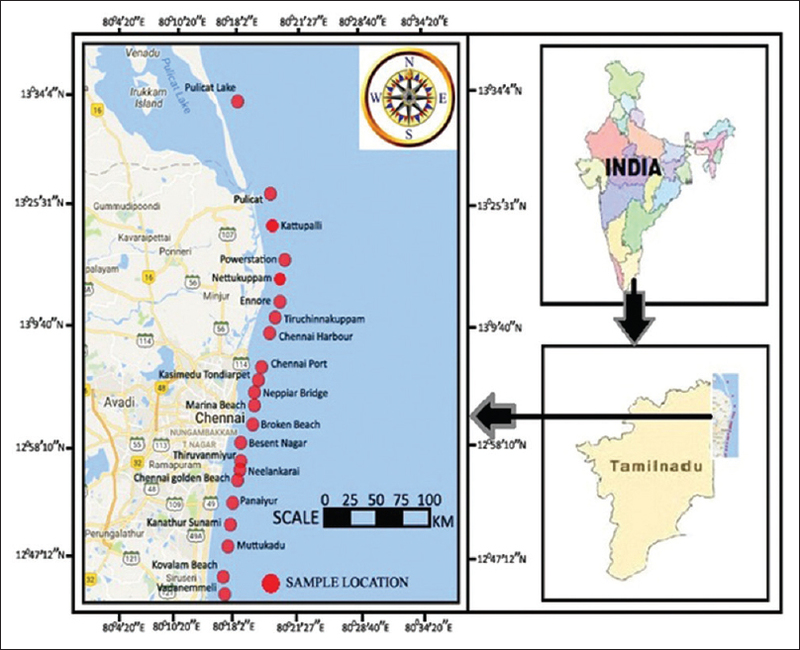 Assessments of radioactivity concentration of natural radionuclides and radiological hazard indices in sediment samples from the East coast of Tamil Nadu, India with statistical approach. Mar Pollut Bull 2015;97:419-30. Kurnaz A, Küçükömeroglu B, Keser R, Okumusoglu NT, Korkmaz F, Karahan G, et al. Determination of radioactivity levels and hazards of soil and sediment samples in Firtina Valley (Rize, Turkey). Appl Radiat Isot 2007;65:1281-9. Ravisankar R, Vanasundari K, Chandrasekaran A, Rajalakshmi A, Suganya M, Vijayagopal P, et al. Measurement of natural radioactivity in building materials of Namakkal, Tamil Nadu, India using gamma-ray spectrometry. Appl Radiat Isot 2012;70:699-704. Khatir SA, Ahamed MM, El-Khangi FA, Nigumi YO, Holm E. Radioactivity levels in the Red Sea coastal environment of Sudan. Mar Pollut Bull 1998;36:19-26. El Mamoney MH, Khater AE. Environmental characterization and radio-ecological impacts of non-nuclear industries on the Red Sea coast. J Environ Radioact 2004;73:151-68. United Nations Scientific Committee on the Effects of Atomic Radiation (UNSCEAR). Sources, Effects and Risks of Ionizing Radiation. Report to the General Assembly with Annex B, United Nations, New York; 2000.